West Bradley is one of the only orchards in the West of England to offer this unique opportunity to visit a working apple farm and select your own produce. The Clifton-Brown family, owners of West Bradley Orchards, invite visitors to bring a picnic, take a walk through the orchards, press apples to make fresh juice and enjoy a family day out. There is a fantastic selection of over 15 eating and cooking apples to choose from and three delicious pear varieties. 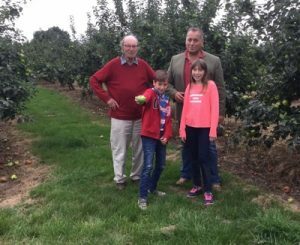 One of only three dessert apple orchards in Somerset and spread over 70 acres, West Bradley Orchards has been growing apples commercially for over a century and sells cider apples, dessert apples, pears and walnuts. The orchard is also home to well-known cider brand Orchard Pig, whose headquarters are located on the farm. For a full list of what you can pick at the orchard check out the list here.